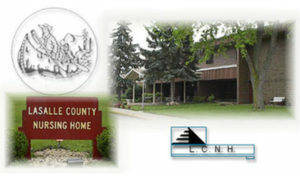 LaSalle County Nursing Home is owned and operated by LaSalle County and governed by the LaSalle County Board. It is located on the beautiful Illinois River approximately 2 miles west of Ottawa on Dee Bennett Road. The Home, with 91 beds, is licensed and certified by Medicare, IDPH and IDPA. The Home’s primary function is to provide nursing care and to meet the Residents nutritional, social, psycho-social, activity and rehabilitation needs. LaSalle County Nursing Home is a safe and comfortable environment, where you can bring your loved one, when care is needed in time when a person can no longer care for themselves, and/or families can no longer assist with their care. Our Nursing Home staff all work together as a team to ensure the physical, emotional and social needs of a resident are met. LaSalle County Nursing Home is fully staffed with caring and dedicated professionals to provide quality long term care and services to people who may need additional assistance with every day living. Our goal here at LaSalle County Nursing Home is to make a resident feel this is a home away from home, whether this would be a short term need or a long term stay. Licensed Nurses on Duty 24 Hrs. The Business Office is located near the front entrance. Its function is to handle all billing and financial accounts. The office is open Monday through Friday, 7:00 AM to 4:00 PM. The office is closed weekends and holidays. The bookkeeper handles the room and board payments for the resident. The nursing home accepts residents either on the basis of private pay, Medicare, or with the assistance of Medicaid. Assets of family members are not involved in the determination of payments. The qualifying process for Illinois Medicaid designation is handled through The Department of Human Services, Macon County Long Term Care Office that is located in Decatur, IL.